Don’t you hate it when you buy a dozen bagels and don’t go through them!? Sure, you could freeze them, but frozen bread always tastes a little off to me… So what do you do? Feed the birds? Throw ’em away? Nah, make bread pudding! 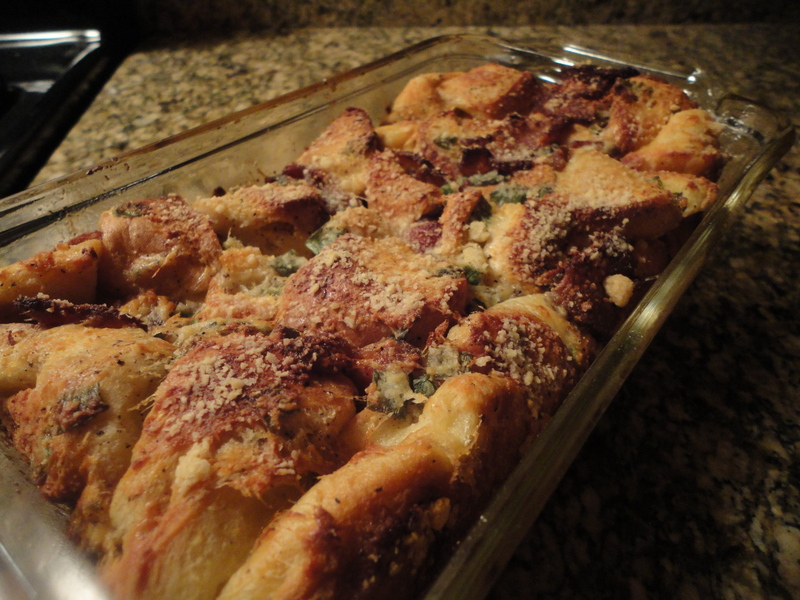 Check out my recipe below for a savory bread pudding with bacon, scallion and parmesan. In a sauté pan or medium sauce pot cook your diced bacon until crispy. Remove the bacon using a slotted spoon, save 1/4c of the rendered fat. In a large bowl combine your cubed bagels, crispy bacon, scallion, garlic, salt, pepper, garlic powder, onion powder and 1/4c of grated parmesan. Drizzle the mixture with the rendered bacon fat and toss to evenly coat the cubed bagels with seasoning and ingredients. Put the bread mixture into a 9×5 loaf pan. In a separate bowl whisk together the eggs and milk. Pour the milk/egg mixture into the loaf pan. Allow the pudding to sit at room temperature for 20 minutes, periodically pressing firmly down on the top so the milk and egg can absorb into the top layer. Much of the liquid will absorb into the cubed bagels by the time you are ready to put it in the oven, but some will still be pooled in the pan. Sprinkle the remaining parmesan cheese evenly over the top of the pudding and place it in the oven. Bake for 35 minutes at 375F. Allow it to rest for 10 minutes at room temperature before serving. So there’s my newest side recipe for ya. Hopefully you make it and love it like I did. New content is coming soon, in the meantime crack open an adult beverage, sit back, and relax. Life is short, enjoy it! Tags: bacon, bread pudding. Bookmark the permalink.